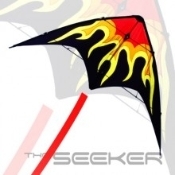 Successful first flights, precision handling, durability and a large wind range make the SEEKER the new standard for entry-level sport kites. The SEEKER not only exhibits striking graphics, it's coupled with Fiberglass Tubes to give the right stiffness and durability. A winner that stands up to the demands and challenges of a new sport kite flier.